Last December, I purchased a few solid color long sleeve drape tops from the Loft and really like them. 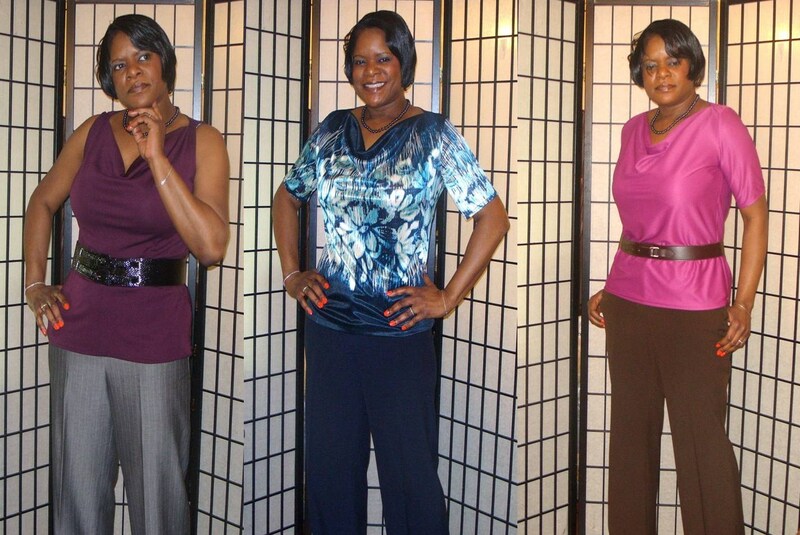 They work so well with a variety of my garments and knew I wanted more. Last Friday, I visited the Loft and noticed the short-sleeved versions and the striped drape top and initially placed them on hold thinking that I would return later to purchase them. However, I remembered my moratorium on clothes shopping and instead went straight home and sifted through my pattern stash and found McCalls 6078. Misses tops. Top A: front & back pleats, front drape, lapped back; Top B has front pleats &drape; top C has front drape and loops. I did Version B with modifications. 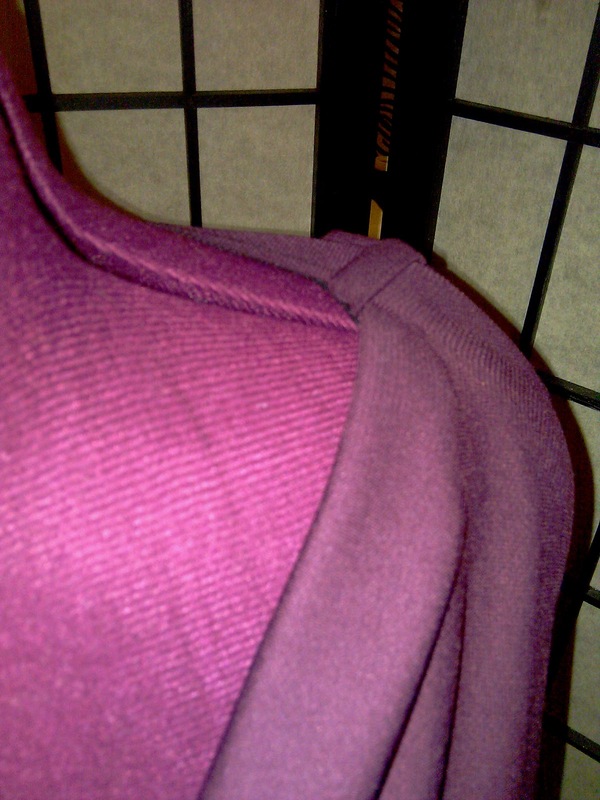 The first one I made was sewn with a deep burgundy stretch fabric from Virgo Fabric Store. The instructions were easy to follow, however I became concerned after stitching the double pleats and sewed the back to front at the shoulders. 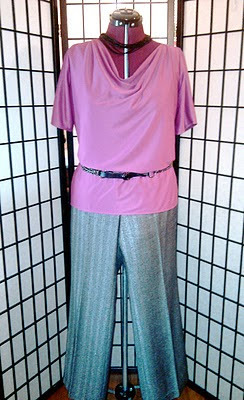 There was bulk at the shoulders and pulled out my Loft drape top and noted that there are no pleats and no bulk. I proceeded on with the top, but found myself fiddling with the shoulders and ended up doing a loop from the fashion fabric to conceal the bulk at the shoulders. 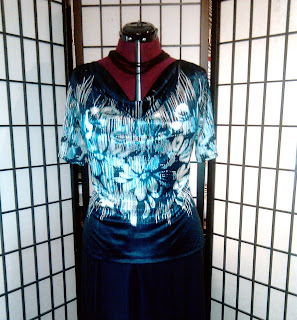 I decided to sew another drape top without the pleats in an attempt to eliminate the bulk at the shoulders. I basically marked the shoulder point where the second pleat should be and sewed the back to the front at the shoulders there. I went one step further and added sleeves from Simplicity 3634 and shortened them. In my happy-state-of-mind I made a 3rd one using a large foral print stretch fabric and again, eliminated the pleats and added sleeves. This one has a center back seam because I was short on fabric and wanted this one to have sleeves too. My family saw this one and called me Hawaii 5-0....lol I know you remember darn near everyone on that show wearing some form of a pucci-esque, abstract or floral short-sleeve button up. Oh Sheila! These are really nice! I too love cowl neck tops!! and have a few of them. I have one on my last post with my balloon skirt. You're so correct, they go with just about everything! You look like you've lost a weight in your blue top, have you?? The tops look great. I like that you were able to omit the pleats out of the top, nice job. "By the way, "Book um Danno, I mean Sheila"
What a wonderful jewel toned trio! Very nice tops. All three outfits look great. Very nice. I love the pattern, fabrics and fit. I love the purply color ! You are prolific!!! I love these tops. 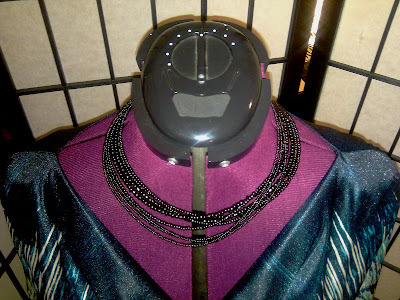 Drape necks are a fave of mine. They look fantastic on you! Wow, these tops are ALL wonderful! Cuuuute! And I love the Hawaii 5-0 one! You can catch bad guys and look good at the same time, lol. The pattern is an instant gratification project, although I had minor issues with the pleating. It all started when I told her I like Tiramisu and she has been in a baking frenzy since. I must say her Tiramisu cake was delicious. Wow!! I need to whip up some fancy tops like yours. I'm in deseparate need of them. Yours are so perfect! Really gorgeous! 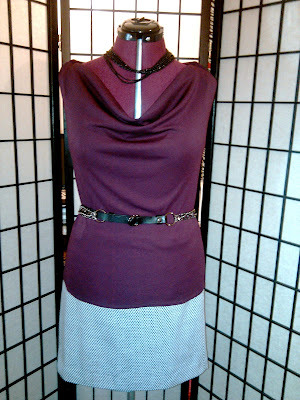 I love cowl neck too! It makes us look stylish so easily! The purple no sleeve version is my fav!! Beautiful tops! No doubt they are total basic cabinet combination. You are way too cool. Love them all! Great work! I like them all but the one with the flowered print is my favorite. You're looking wistfully as to what you will create next. Ok, Shelia - you always create outfits that are well put together, a are very flattering but i want to know when are you going to audition for America Next Top Model , go gurl ! There you go again. Love the tops and the variations. You have me wanting to put up my hooks and needles and get my machines and the material that has been calling my name since last year. Can't wait to see what's next. Lovely tops! They sure go a long way and are effortlessly stylish! Great looking tops. Love the pose! They're fabulous! Now I love cowls too, but how do you keep them from showing too much when you lean forward? I haven't figured that out yet, and I apparently lean forward a good bit. LOL - I need to practice that move! This is a great one to add to the TNT collection. I'm putting this it on my list to buy at the next pattern sale. All of your tops look great.